In between my manly chores of clearing yet more snow off the driveway and making chocolate chip oatmeal cookies I finished off a few Overhilse gunners in 1880 campaign dress. 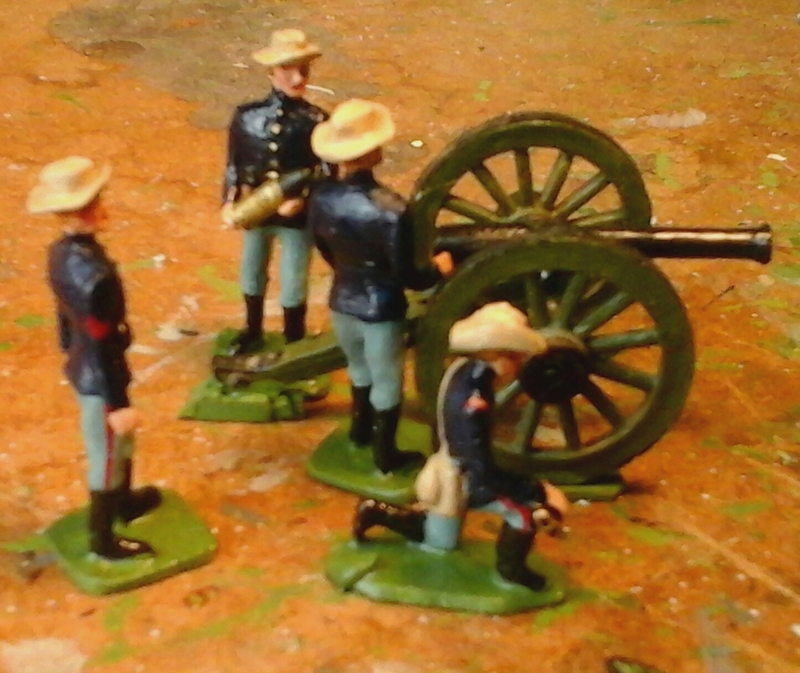 Scruby 40mm ACW artillery in slouch hat from Historifigs with officer converted from a Zinnbrigade gunner. The gun is a Scruby ACW gun converted to a breech loader. The round about to be loaded is from one of the Zinnbrigade moulds.. It is a bit annoying that Oberhilse greatly out numbers Faraway but is still building while Faraway is stalled. However, I can cast or buy as many Bluecoats as I want or need but am waiting on upcoming Redcoats. I was a bit startled when I stumbled across a blog post indicating that 18 months have passed since I last sculpted an 1870 Canadian infantryman then botched the mold so badly that it was unusable. Time to get back on that horse. Ironically in 54mm I had the opposite problem. Plenty of redcoats but for blue I had to borrow plastic ACW which were a little larger and VERY different stylistically. If I had gone with 1880 and Oberhilse then I did have suitable moulds on hand, and still do. The 6" grid looks very suitable for 54mm troops and this 40mm painting push may be part of a desperate attempt to forestall their return. Mounted Rifles are up next. 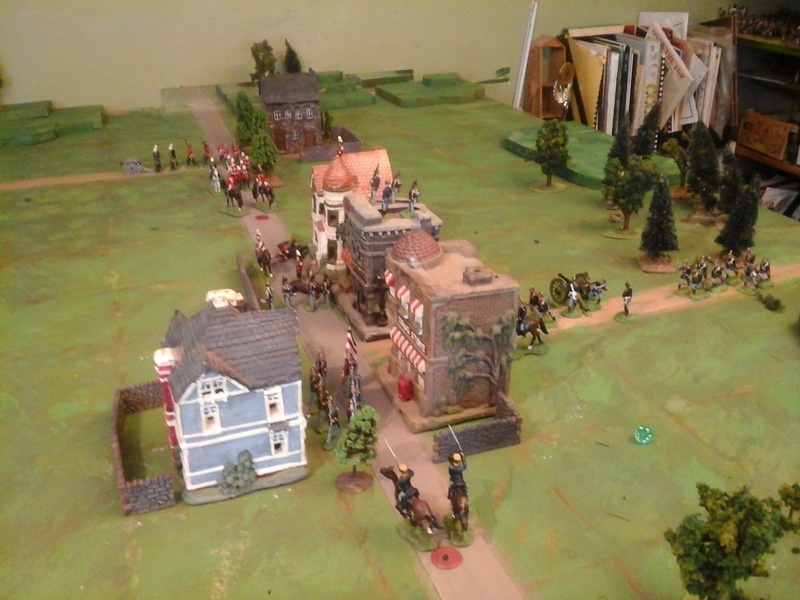 From a November 2011 narrative battle report of a refight of Blasthof Bridge using my antique and new Britain's. Some things change, some don't. Today I searched back through the archives for posts on the Square Brigadier, especially those with a Colonial angle. One of the first I read was from March 28 2013 in which I wrote that the snow was largely gone and the garlic and crocus shoots were peeking up through the soil. 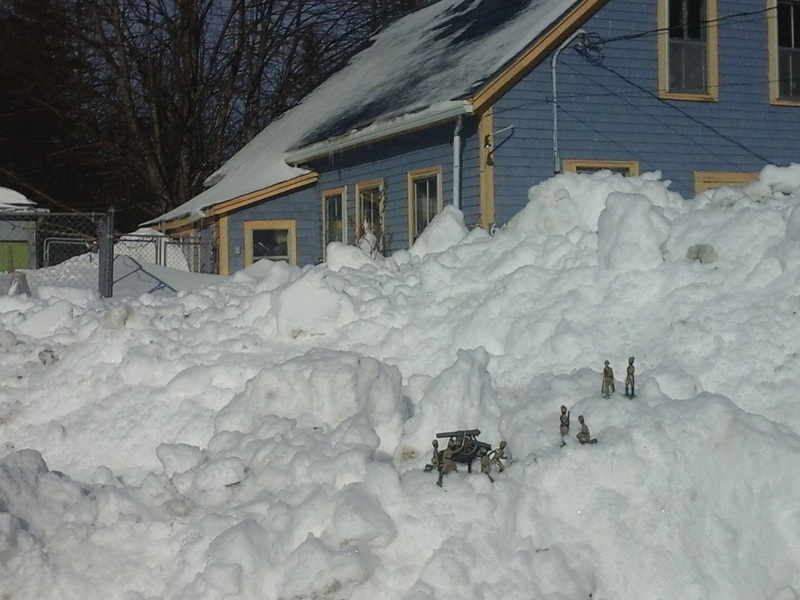 Well, on the 28th this year there was 3 feet of snow over the garlic and a whopping 6 foot deep snowbank over the crocus and tulips. On the other hand in that post I had just painted a 2nd Hussar for the Overhilse Hussars of the Republic and mentioned that I had 2 more ready to paint so as to bring the squadron up to strength. By an odd coincidence I just finished them yesterday, 2 years later! Oberhilse cavalry prepare to sortie from the lines. Anyway I got my answers since, as suspected, I had been down this road before. The answer is essentially that the Square Brigadier is about the General and the handling of the army, not about unit tactics and formations. So, putting that Old School aspect aside, I once again stripped down the rules to their original pattern. This assumes that unit officers are doing their job and lets the dice show how well they have done it while the general focuses on the plan and the handling of reserves. I was also reminded that making the squares larger was mostly about making more room for 40mm friendly terrain not about changing the game. The forlorn has been repulsed. 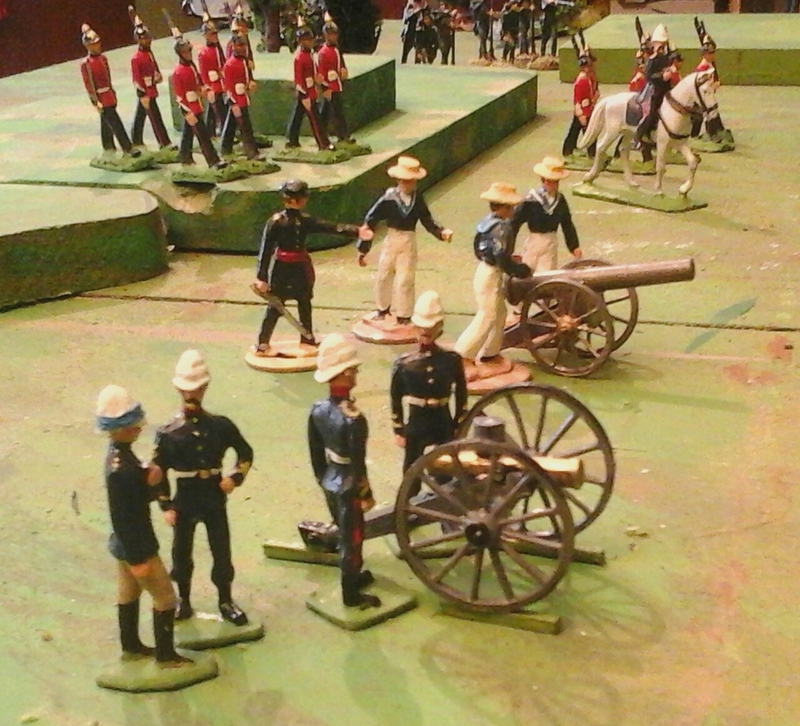 Brigadier Marten leads his reserves forward to try again, and again. Nice to back in the era of black powder so I can mark units that have fired again! That's the 4.7" in the far corner firing its first shot. Technically its too early for the 4.7" but its similar enough to earlier heavy naval guns used in other colonial campaigns of the day that its staying. 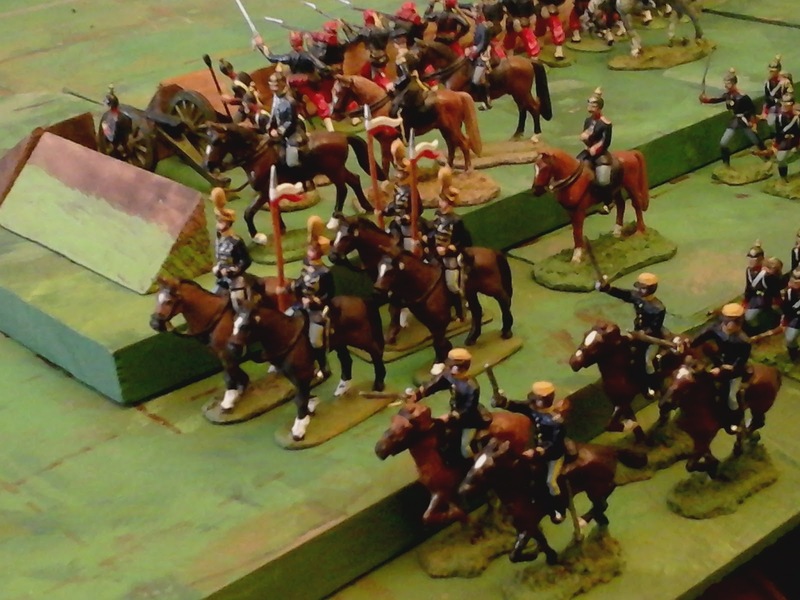 Yesterday I reset last week's scenario to fit Atlantica in the 1880's and played around rather unsuccessfully with various more detailed variants of the Square Brigadier including, formations, morale checks, bayonet charges and so on. Today I played through an exciting solo game using a stripped down, retro, version. I'll be polishing the draft this week and playing again soon. The f1rst ever charge by tbe Hussars of the Republic was repulsed by firepower but they had charged the gatling bravely and covered the advance of the infantry. In the end Blue's accurate shooting decided the day and after heavy casualties with 3 infantry units and the gatling destroyed, and General Marten wounded, the Queen's red coats were forced to give up and retreat covered by the Navy's guns. Plan!? I had a plan? Well, more a framework really but last year's foray into the Great War has led to unintended ripples which threaten to warp my whole Atlantica history, geography and developing storyline. Since I am now ready to tackle both the traditional British toy soldier/Colonial look and my already developing storyline again, I have decided to intervene and put more distance between Atlantica and the Great War (and the 2nd Boer War). There is actually a fairly narrow window of historical settings for the classic Victorian red coated toy soldier to march into battle before Khaki takes over. It runs roughly from roughly from the Zulu War to the 1885 NorthWest rebellion. OK the latter is not a popular one but it was the only one where the spiked helmet was worn on campaign. I have wargamed in this era in 15mm, 20mm, 25mm and 54mm so was trying to avoid it in 40mm but...oh well... It's just a very fitting period for wargames especially since the Russo-Turkish and Franco-Prussian wars, give a glimpse of what British involvement in a European war in the breech loader age might look like on a wargame table. 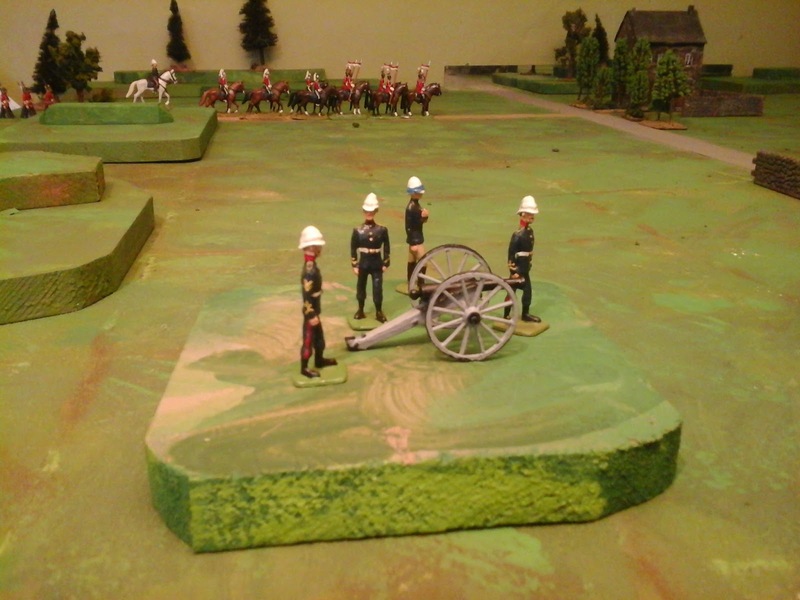 The Royal Faraway Artillery try out their new toy, a Gatling. The gun is a pre-release sample of the to be re-released 40mm Scruby model. Mike at Historifigs hasn't yet done (or at least didn't send me) a magazine so I used a piece of dowelling to represent the RN style magazine. I intend to use a naval crew but between the 4.7" and the naval 12 pdr, they were all busy. In practical terms this turning back of the clock to circa 1880 means that Oberhilse uniforms will regain their US influence, the Hougal rebellion has not happened so those units rejoin the ranks and the terrain, climate and native cultures will not be under pressure to change. I won't get to include motor vehicles just yet but the 20th Century and drab are still coming. In addition to doing some painting, I'm also reconsidering the rules. Essentially, for this collection, I want the same number of units but more figures. Its possible to do that without changing the rules but this is the time to consider the pros and cons of a different, more OS style of rules for these games. Last Sunday Rob from the Sharp End of the Brush blog dropped in via Google Hangout for a game. The scenario was Forlorn Hope 2 from Wargames for All Ages, the troops were 40mm Prince August and the rules were Charge! by Lawford and Young.The situation is that a surprise attack is being launched against 2 redoubts that guard the end of a fortified position. The scenario is so similar to an article written by Charles Grant for Stuart Asquith's Practical Wargaming magazine on a similar at Yorktown that I can't help but imagine that it was inspired by that event. The forlorn hopes charge as supports move up. 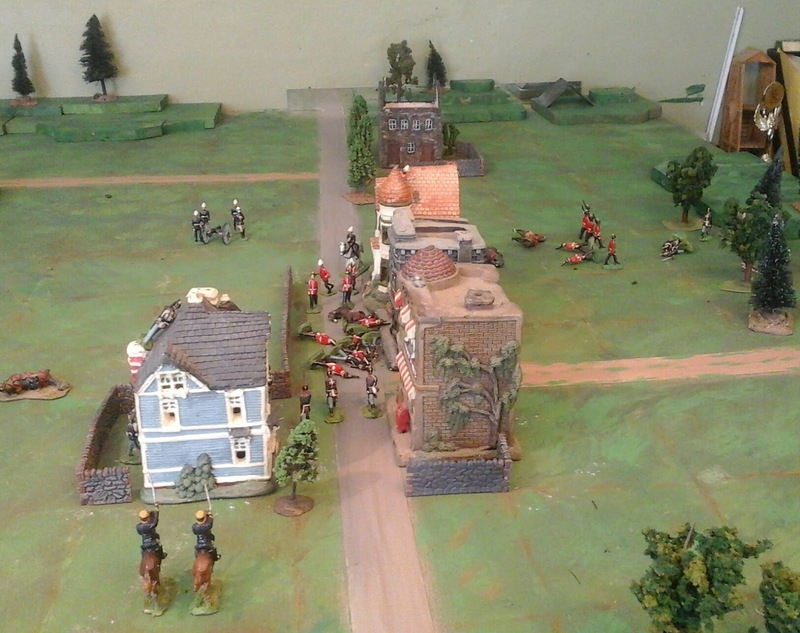 On the right the 1/2 company of grenadiers are cut down by musket fire. A few struggle to the top to fight hand to hand but none made it back out. At the left redoubt however, the rest of the grenadiers stormed in before the garrison was fully awake and captured redoubt and gun, driving out the company of the Queen's Foreign Regiment. As usual the scenario required tweaking to fit the rules and table. The scenario has rules for the forlorn hopes to approach the redoubts without being spotted as well as defined delays for the defender's reactions. My table is slightly smaller than the map suggests but instead of shrinking to fit, I tried to keep the distances between front line, redoubts and main position constant and trimmed the edges. The rules allow the defender to roll once per turn per redoubt to check if sentries have spotted the advancing forlorn hopes. Since Charles usually uses The Wargame which has shorter moves than Charge! (7" in column iir vs 15" in charge) I allowed the defender to roll twice per turn instead. Rob chose to defend, a good decision given the poor video quality he was experiencing, partly due to bandwidth issues but mostly to the poor lighting which my tablet camera doesn't handle well. Hopefully this will be the year I get that resolved. Light Infantry swarm the redoubt as more Irish move up but the now understrength garrison spikes the gun and retreats just as the Crown Prince Carabineers emerge from the main position. Its sometimes tricky translating scenario units into game units since the book is a bit vague. In this case the redoubts hold 1/2 a unit and the forlorn hopes are each a 1/4 unit. 4 figures and an officer wouldn't make much of a storming party in Charge! but my table isn't big enough to use a 4 company, 80 figure Charge! reginent for each scenario unit so I normally use 2 company battalions. This gave the defender 1 company and 1 gun in the redoubts, another gun in the main line and Rob's choice of 4 companies or squadrons from a force of 8. I used 1/2 of my new Irish grenadier company for each of the forlorn hopes supported by a company of light infantry, 4 guns and 3 companies of line infantry. The National Regiment advances in column on the captured redoubt while the remnants of the garrison retreat quickly, dragging a lone prisoner with them. Beyond them the Carabineers have no problem driving in the light infantry who had fired wildly as they charged. 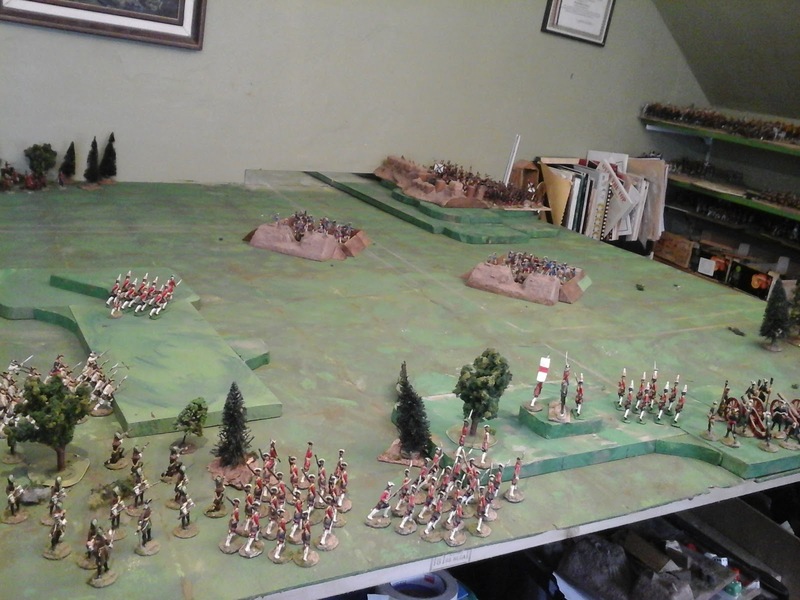 A battered company of Irish have entered the redoubt just ahead of the counter attack while a fresh company prepares to stem the cavalry attack. Unseen, the rebel's green coated Staarborde Battery has dragged its guns forward to sweep the rear of the redoubt with cannister while the gun in the fort has just knocked out one of the guns of the red coated Port Battery who hve been firing from the edge of the wood off to the Rebel's left rear. The scenario looked pretty straight forward and I figured it might take us an hour to play not counting idle chat and planning for Huzzah. To my surprise we ended up playing 9 turns over at least 2 hours of playing time and it ended up being a challenging game with a cliffhanger ending. At least part of the excitement was down to the rules which use simultaneous moves to written turn orders allowing me to make several small blunders, no dice required and Rob to surprise me at least once. The combat system is also capable of the occasional wild swing of multiple dice away from average with possibly catastrophic results if it comes at just the wrong (or right) time. A final word. The SD card in my camera fried last week and since the tablet was occupied with the video conference, I had grabbed an old smartphone for pictures. It really doesn't like dim lighting hence the blurry pictures. The tablet isn't much better and with bandwith issues thrown in, here is what the game looked like at Rob's end. Talk about fog of war! 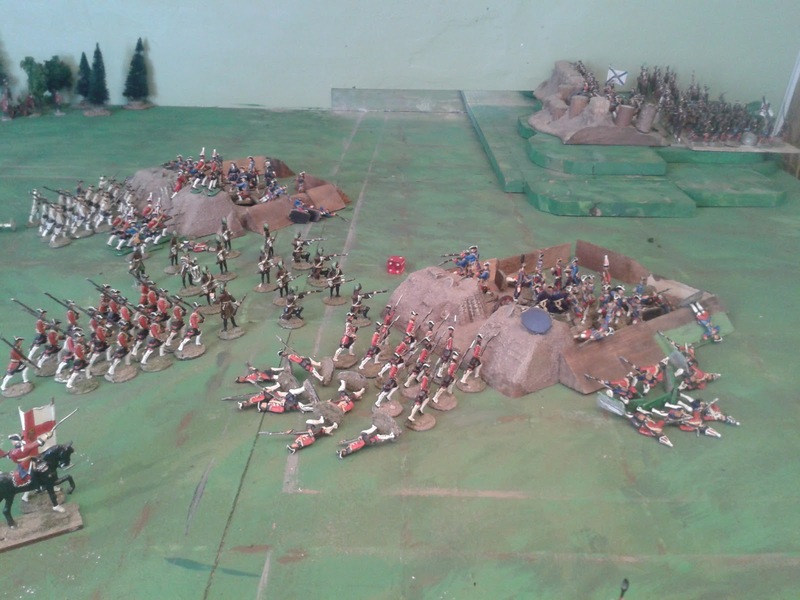 Through a storm of musketry and cannister the National Regiment stormed forward wiping out the Irish garrison. To their right the Carabineers crashed into the redcoated line, and were held. A quick count confirmed suspicion that the Irish were understrength and all companies had to withdraw. It looked like defeat but looking at the pile of Pandour casualties from the National Regiment I decided to check their morale. Understrength! Just! They would also have to withdraw allowing the now rallied light infantry to slip in the back. 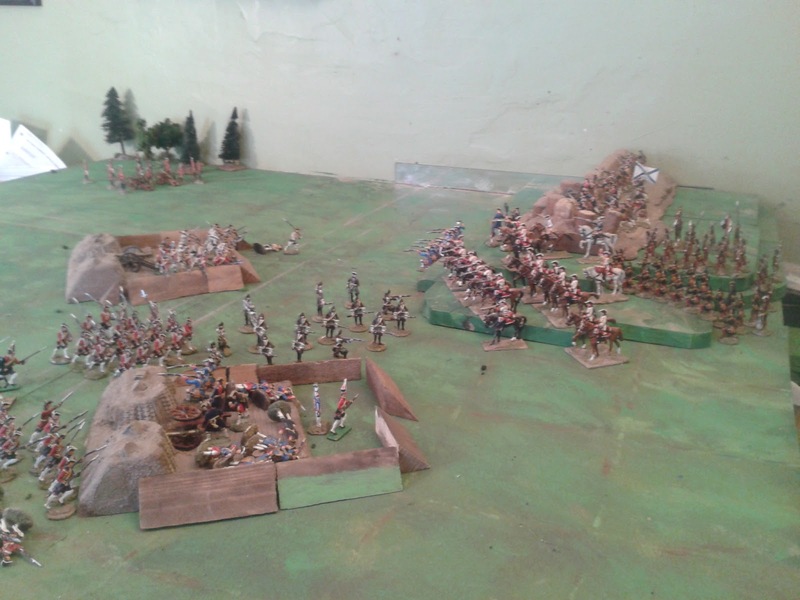 With both redoubts in Rebel hands it was a victory if a squeeker of a Pyrrhic one. Hopefully the main Rebel army is just off table, moving up in support. Its been over a year since my semiflat Prince August troops last saw action My Irish Grenadiers have never seen action. In May Rob & I will be running two Not Quite The Seven Years War games at Huzzah in Maine and its been a few months since our last remote game. All that adds up to time for a remote NQSYW game! The troops set up in accordance with the scenario. This is roughly the camera angle that Rob will see tomorrow when we connect with Google Hangout for the game. The scenario is Forlorn Hope 2 from Scenarios for All Ages by Asquith & Young aka The Red Book. If all goes well there should be a report by Monday. Another fine plan down the drain. I did eventually manage to finish the game, a turn here, 2 turns there, 12 in all, snuck in around hours of shovelling, chopping and bailing melt water after yet another 2 feet of snow were dropped on us on Wednesday. I've been tired enough though that the details are fuzzy and I'm too tired to write. So here's the 5 minute version. Comments on the rules etc will have to wait until sometime next week as I need to turn my attention to setting up the planned Charge! game on Sunday but I like the bigger grid. The initial cavalry clash went against the Blue Dragoons but an attempt by the Queen's Lancers to follow up and drive out the Oberhilse infantry was bloodily repulsed. The 2nd squadron dismounted and managed to hang on until relieved. With opposing troops fighting along main street, the Faraway artillery backed by cavalry watched the right flank and shelled the rear of the town. 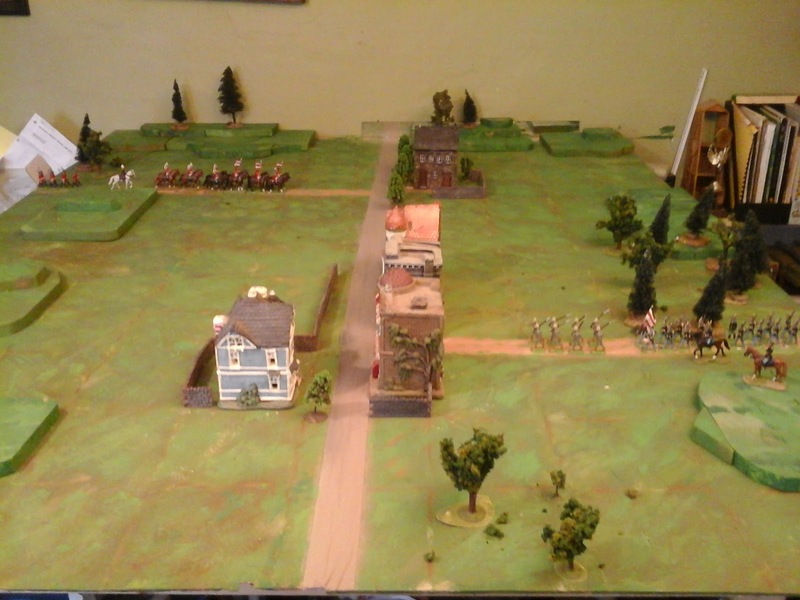 On the opposite flank the Oberhilse infantry and artillery began to flank the redcoats in town while threatening the far village. There seemed like small room for the Red cavalry to intervene unless they were willing to brave artillery and rifle fire in a bold but probably suicidal charge. They got lucky! 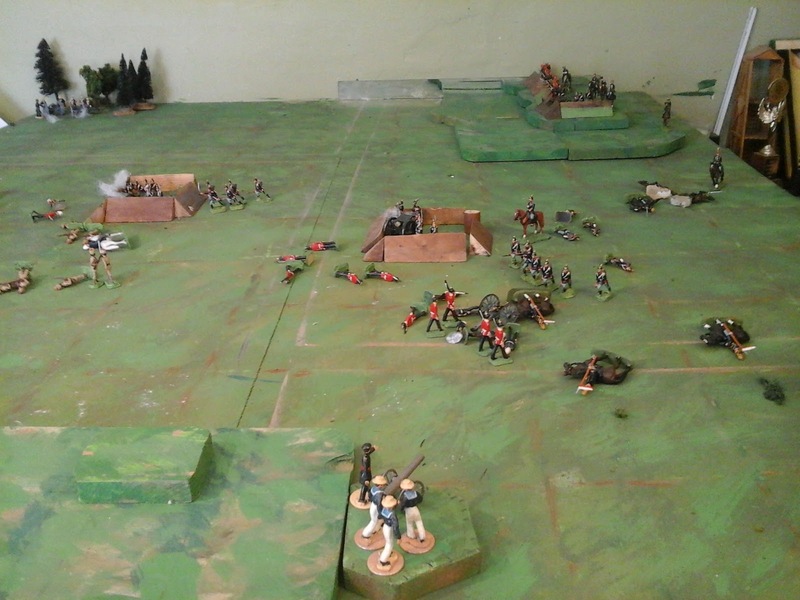 A whirlwind of cavalry drove the guns off and sent the 2nd Blue Guards scurrying into the cover of the woods. 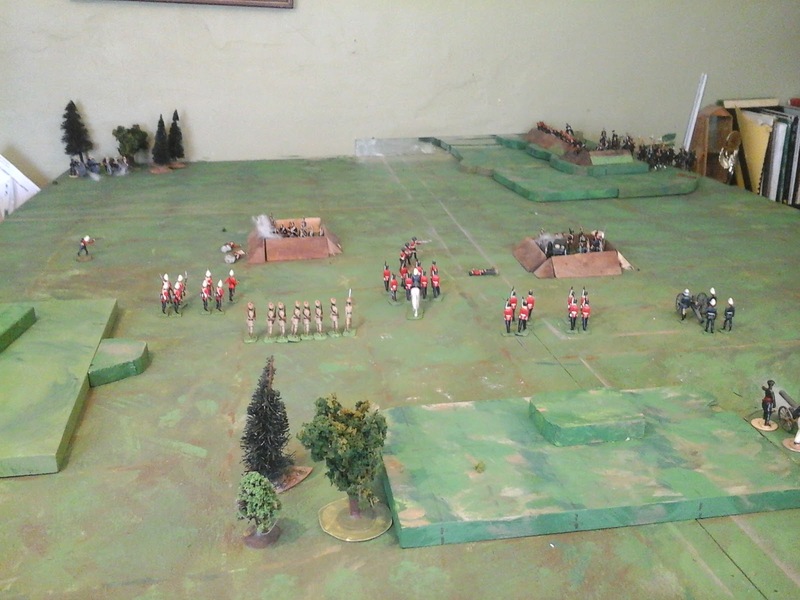 The first Guards were sent to drive the redcoats out of the town to grab back the advantage but the Red infantry was as lucky as the horsemen and the attack was repelled. Various attempts by the Blue Dragoons to emulate their opponents were driven back by fire but the efforts did give some relief to the infantry huddling for cover amongst the buildings. At length the Red commander decided to abandon the far village and send all of his infantry forward. They were just in time. A fierce and prolonged firefight eventually saw the Blue infantry driven off leaving the road and town in Red's hands. It was a bloody business though with over all casualties fairly even and nip and tuck at the end as to who would blink first. A soldier's battle with little for either commander to brag about. I'm not sure if the Royal Artillery's motto and Battle Honour was granted to Indian mountain batteries as it was to the RCA but this winter it seems to apply to ice and snow. Today the 40mm Toy Soldiers of the 1st Koolahat Battery reenacted the epic feat of dragging the guns of the 1st Kashmir artillery over the snow covered Shandour Pass in the Hindu Kush during the Rlief of Chitral. See Blackwood Tales from the Outpost II for an account by the young English officer on command of the guns. This snow is of course my excuse for not getting more painting and gaming done this winter. Battle report on the current suspended game probably Friday then a NQSYW remote player game on Sunday. A print of the real thing from the British Battles article on the Relief. It was a close call and no doubt about it. I nearly got trapped again in the quagmire of constant scale. Fortunately, by reviewing posts from last fall, I was able to remind myself of how and why the game has reached this point, things not changed by having larger grid areas. In fact, apart from acknowledging that my artillery long range will have to be too short to avoid being irrelevant and accepting that most scenarios will involve detachments from too many battalions just so I can name them and paint a greater variety of uniforms, there was no need to change anything, just an option to finally differentiate between bayonet charges and close range firefights since the areas are big enough to hold units of both sides. This is more about narrative, flavour and OSW tradition than anything else but its something I have missed. The second half of turn 3. 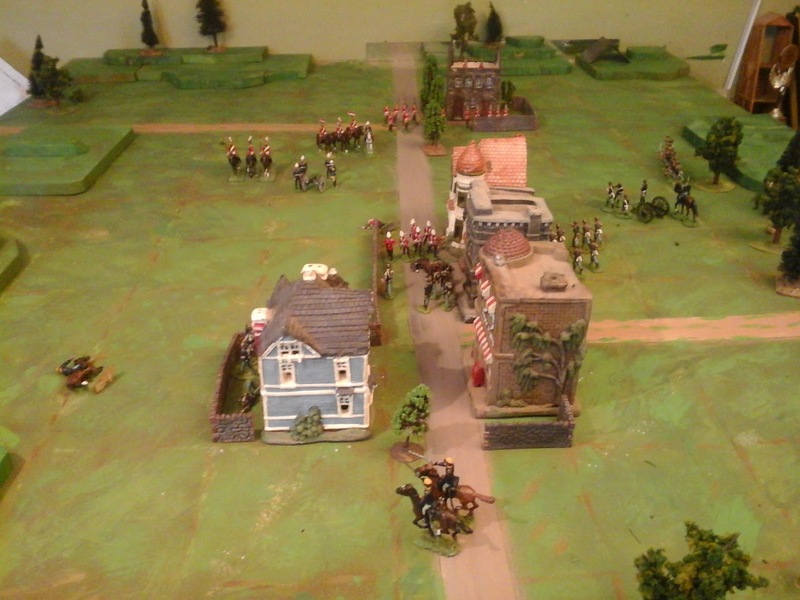 The Blue Dragoons charge the Queen's Lancers while infantry and guns rush forward on both sides. In order to make it work as seamlessly as possible I went back to an idea I had tried last fall and liked but which didn't work well with the initiative turn sequence. The turn system will now be the old A moves, B shoots, check morale, resolve charges. Not having to rewrite too much or change from 4 and 8 figure units to 6 and 12 figure ones and so on, I was able to paint the 2nd half of my Buffs and fix an error in my updated Oberhilse Dragoon uniform. It turns out the later was based on a proposed uniform which had been rejected as being dreary rather than drab. Since this is the Blue army I skipped the various grey and khaki versions and put them into the pre drab blue uniform with yellow topped kepis, yellow trim and black leather. Much shinier! I was reluctantly torn away from the game by duties but hope to finish tomorrow. Amazing how interesting and challanging such a small game can be despite fast play rules and only 6 units a side. It's an old army tradition to hurry up and wait so I guess its appropriate for this hobby. In any event while my table upgrade is by no means finished, it is sufficiently along that I want to play a game to try it out. Before I play though there are a few things I want to do. 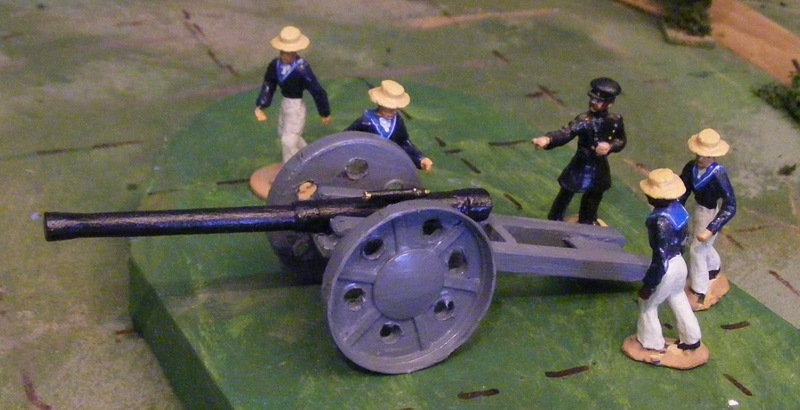 40mm Scuby gun and crew. I want to review possible rule modifications to take advantage of the larger units with more elbow room. This isn't necessary but I might as well take advantage of the chance to look at things before playing. Rules aren't the main delay though. Ever since I casually put aside my Great War venture to stage an earlier Colonial train ambush game I have been inventing new Atlantican factions, wars and uniforms on the fly and improvising tabletop forces. Now that I feel settled as to what the games will be like I want to spend a little time getting the units in play up to scratch and some time figuring out the 'historical' and geographic background, scenario options and by extension, uniforms, units and so on. I'm not sure that everything I want to dabble in over the next 20 years will fit into the Atlantica background but as long as the armies are small enough there will be room for historical or other fictional settings as well. I am especially keen on getting to some of the 'extras', bands, hospitals and so on. The table needs a lot of work yet but it'll probably be done in dribs and drabs over the next year. Any vague resemblance between Marketown and Sawmill Village is due to me improvising modifications as the mood took me when laying out the scenario by memory. Another 30 - 40 cm of snow, freezing rain and high winds forecast for Sunday until Monday so a Snow Day, but will I paint or play? A few days ago I started to think about my next solo game. There are a few figures that I want to paint before I play again but I thought that was it. One of the dangers of the blogosphere however, is inspiration when you weren't looking for any. I think I was weakened a little by looking at Kevin's splendid new naval brigade but the trigger for my internal disturbance came when a certain Duke calmly mentioned making a bounce stick for Tony Bath's Horse & Musket rules as presented in Lost Tales. I didn't remember looking at said rules when I got the book and next thing you know I was neck deep in Don Featherstone's Colonial and WWI in East Africa rules and picturing 20 man units of 40mm Askari. It was nip and tuck but I eventually managed to drag myself back to reality before any serious damage was done, just another attempt to differentiate between close range firefights and charges with cold steel, oh and a decision that I was right last year and I should be using a grid with a smaller number of larger squares, squares big enough to each hold one of my 8 man infantry battalions in extended order or 2 battalions in close order. Of course it would be rather impetuous to have the thought over coffee one morning and have it repainted by lunch. Besides the base color is waaay too translucent and needs to dry overnight before I add more shades to break it up and hide the intermediate grid. 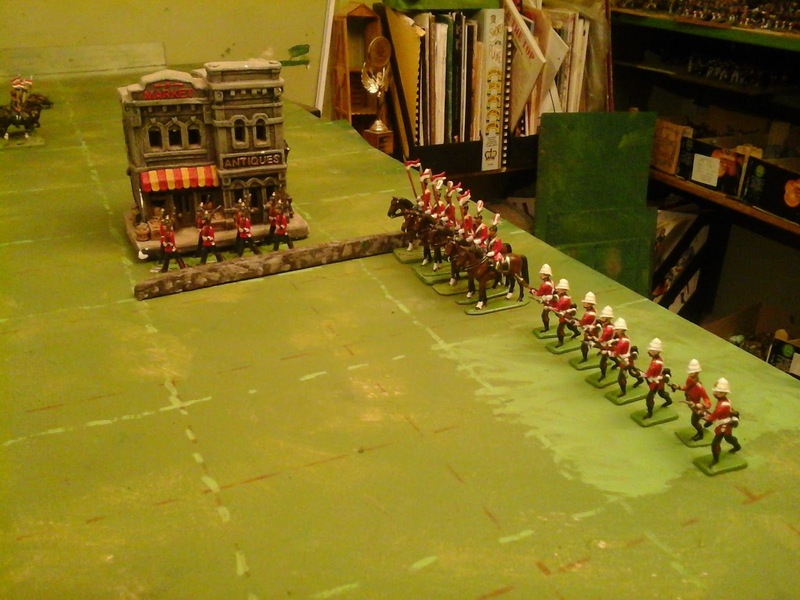 Here we see a battalion in road column passing through a town block, a battalion in extended order and a regiment of cavalry. Each of these would be a scenario unit. This change means rolling back range and movement increases found necessary with 270 squares rather than the 120 originally used with the Square Brigadier. Apart from the look of the thing when using larger squares, experience tells me that the smaller number of squares tends to make for a tighter, more intense game with less drag. Ok got a gun, now what is the colour scheme? The only pictures I have of the real 4.7" guns are Black & White and none of my brief sources thought to mention colour. In most pictures the barrels don't look much different than the carriage, sometimes a little darker. I have read stories of British units going crazy with khaki paint during the Boer War, even painting mules, though that might be apocryphal, but a monochrome model was not going to cut it. 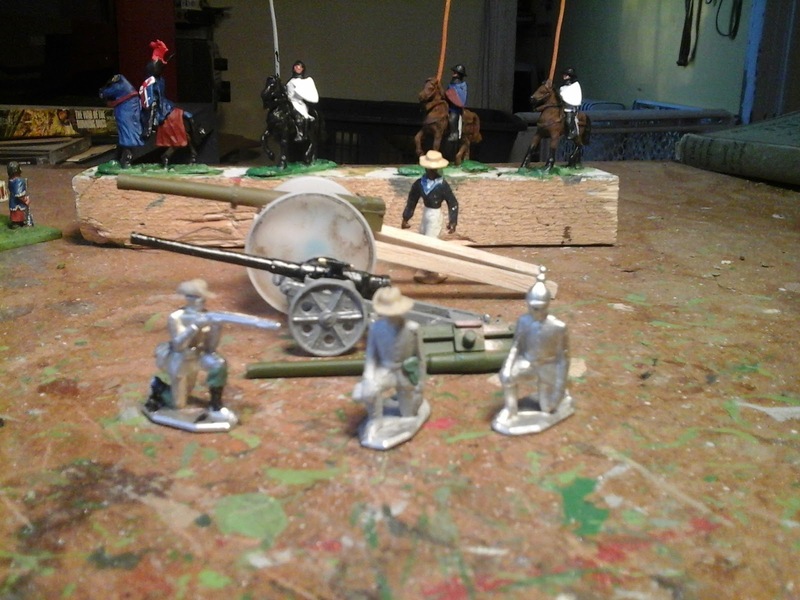 The finished gun with temporary crew from my Mid 19thC forces. Homemade 40mm sailors with converted Scruby ACW officer. The original Britain's model came with a grey carriage and bronze barrel. The grey seemed plausible but I'm pretty sure the barrels were steel not bronze. Then I found a picture of the burst barrel of a 4.7 that supposedly was used in the Boer War and then at Gallipoli. Pic from Wikimedia of a 4.7" gun barrel abandoned at Gallipoli. Black! There we are then. Now what about the crew? If this was an historical project I would have to do the sailors in standard army khaki with a naval straw hat. Borrrrrring! Luckily my old favorite History of The War in South Africa by James H Birch. (You can download it or read it on line, pictures included, here on openlibrary.org ) has a more attractive version seen below. 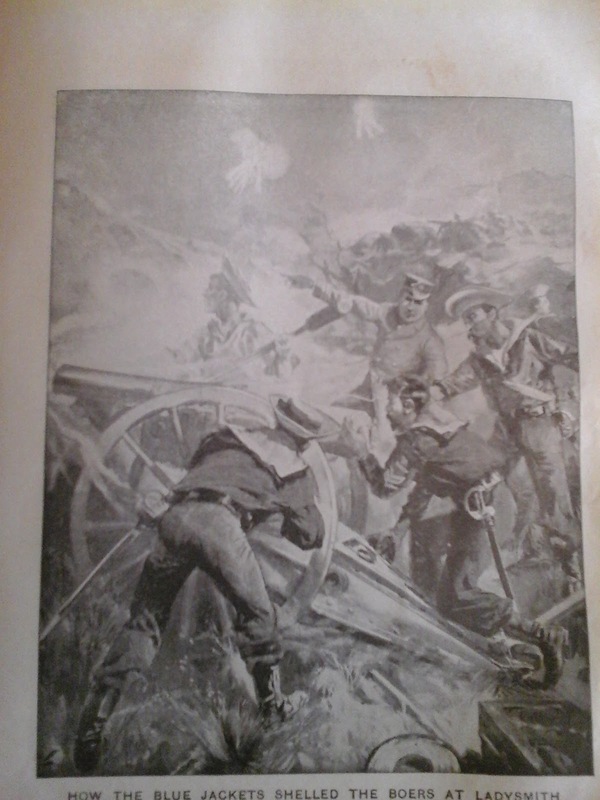 "How the Blue Jackets shelled the Boers at Ladysmith". But I also found this on the net. We were supposed to get more snow today, and we did get a smatter but by lunchtime the sun was shining. None the less, I had promised myself a "snow day", retired or not and no such detail was going to rob me! Not being in the mood to paint I set to work on the 4.7". 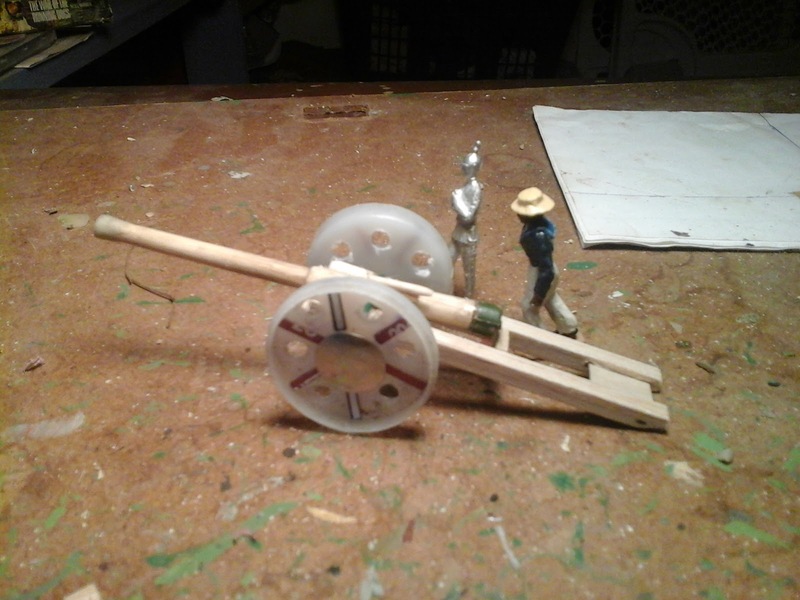 Having destroyed an old Tamiya 25 pounder and a $ store Marx ripoff howitzer without being quite satisfied, I was forced to fall back on my initial idea of wood dowelling. I have heard that planning, patience and precision are useful assets in making a model but alas none of the hobby stores stock any of these. Luckily I am easily pleased and the vague suggestion + glossy paint seems to work well. In other words, none of the detail is quite right but I am extremely pleased so far. "Joe Chamberlain" at Magersfontein from the Wikipedia article on the 4.7"
If all goes well I'm off to WWII North Africa tomorrow (on Ron's game table that is if any govt agencies are monitering this) but I expect to be applying paint by the weekend. Again from Wikipedia. I knew some 4.7's on an improved wooden carriage were used in Africa during WW1 but I didn't realized that they were used in small numbers in France, here by Canadian gunners. The carriage is the new metal version which is closer to the original Britain's model used by HG Wells, apart from the wheels. Luckily I didn't notice the picture until I was too far in to start over. Maybe later. Time to get back to working on some more 40mm toy soldiers myself. A few weeks ago I started on some more 1914 Brits but ...(insert excuses) ... and now I've decided to let the 1914 armies stand as they are for the foreseeable future. Since I had not yet started on the distinctive WW1 webbing I decided to just swap the hats and paint them as Boer War Canadians in slouch hats with the brim turned up. Having scrounged up a little bit of near dead putty I set to work. The result before sanding is ok, not great but it'll do for one offs. Then, before I added bandoliers I decided to flip to that picture of the Yukon Field Force in red coats and slouch hats, much more colourful. While looking at equipment and leggings an alarm went off in the back of my mind. Eventually I twigged. 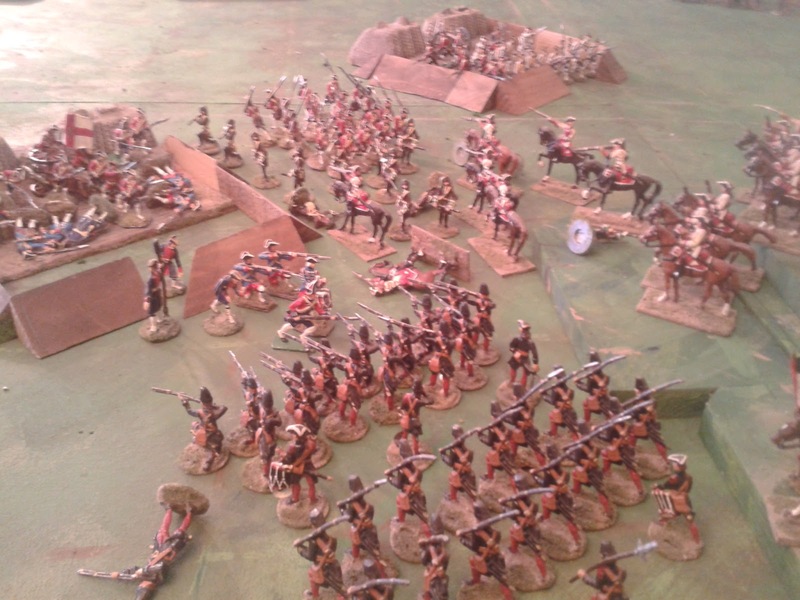 Her Majesty's troops turned up the left brim, the side where the rifle is shouldered. I had turned up the right one! 40mm Zinnbrigade in front, Jacklex 4.7" and a 1st mockup of a 40mm version behind. 25mm Garrison medievals behind. One thing I have been fretting about is a 4.7" gun, can't take Little Wars as inspiration and not want one. Initially I planned to buy the Little Briton's one but the picture just doesn't do it for me. The little 20mm Jacklex one is a superb little model that looks like its straight from a photo. The original Britain's was close and had a charm of its own but the LB one has nice wheels but lacks the elegance and length of the thing. So I have started playing about with bits and pieces as can be seen in the picture. Speaking of Scruby and artillery, Mike at Historifigs has been working on rescuing the 40mm Scruby Colonial range and it WILL include a gun! Watch this space!